Ever since I moved from Korea to Seattle in August of this year, I’ve been looking for a good place to buy kimchi. There is the Seattle area Korean supermarket, H-Mart, one in Lynnwood and the other in Federal Way, where I know they’ll have a good kimchi. I live in downtown Seattle – without wheels. Bus and bike are my two options. I guess I could rent a zipcar, but my last experience with zipcar was: don’t drive where you know there may be even a slightest chance of traffic, because you won’t be able to get back on time. Then I discoved Uwajimaya in the International District. Uwajimaya is an Japanese/Asian supermarket, not unlike the H-Mart but it’s within biking distance. Sweet. But when I went there for the first time a few weeks ago, they had only sucky “Young” brand kimchi or an even more mysterious “Seoul” brand kimchi which claimed “No MSG” but manufactured in CA by a company that had “Lucky” in its name. My educated guess is that if you have “Lucky” in your company’s name, you sure ain’t Korean, unless you are the only Korean company with “Lucky” in its name – “Lucky Goldstar” a.k.a. LG. So I was left to buying tiny $1 optional kimchi from the local take-out Korean/Japanese bento place close to work… sad. I was feeling like Popeye without spinach. When I went back to Uwajimaya today, I reluctantly put in my basket a jar of the “Seoul” brand kimchi, since the “Young” brand so proudly claimed on its jar the abundant use of MSG. I was growing the refrigerated goods section when, Pow! I stumbled across the “Kimchi” section. Huh? I was a little dumbfounded. I don’t get it. Why would they have 2 kimchi sections? One close to the fish section and the other behind the fresh produce section? It just made no sense. 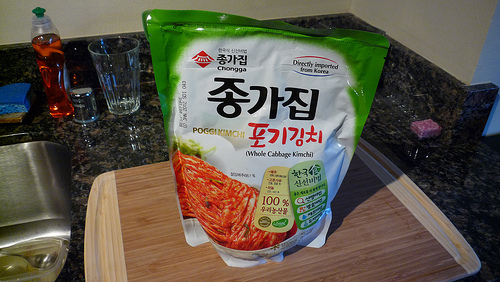 The happy ending to this story is that I found myself with a 1KG bag of Chongga (종가집) kimchi “imported from Korea”. At $12 it ain’t so bad, since the same bag would code around $8 in Korea anyway. My sleepless in Seattle days are over. Update: I now have a site dedicated to good kimchi – GoodKimchi.com! The Chongga Poggikimchi is the way to go. Tried and tested to be true.